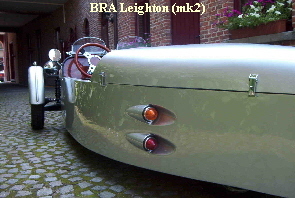 BRA ceased production of the Leighton 2002 when the project was sold to a company in Kent. The project has since been sold again. BRA purchased the Leighton project in 1999. Originally designed by GCS Hawke the car was completely remodelled before it's launch in January 2000, the first new kit car of the millennium! 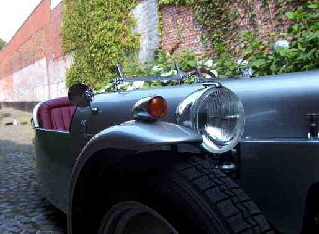 Citroen 2CV. 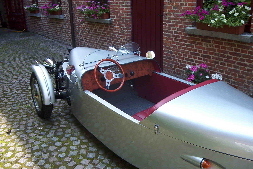 Other 2CV components included the steering mechanism, front suspension arms and some ancillary equipment. Front suspension comprised of coil over dampers which mounted between the chassis and the front suspension arms. Small damper brackets, welded to the front arms, were a standard BRA modification. Rear suspension comprised a single Metro rear suspension arm with coil over damper. The body work was manufactured using gel coat finish GRP in a choice of colours. 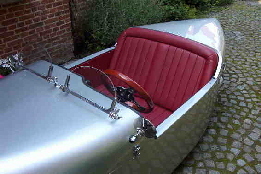 The main, one piece, body section formed the complete side panels and included frenched rear lighting mounts. 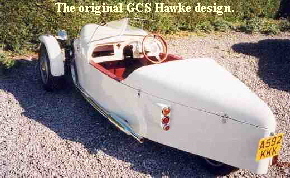 The bodywork was made complete with matching nose cone/bonnet/scuttle (one piece moulding), boot lid and cycle wings. Weighing less that 350kg the car had remarkable performance and, due to the adjustable coil over dampers, handling was superb. Only 16 Leighton kits were produced by BRA and the project was sold, along with the CV3, in 2001.